Learn How To Plaster Today with Step by Step guides and Easy ways to practice at Home. 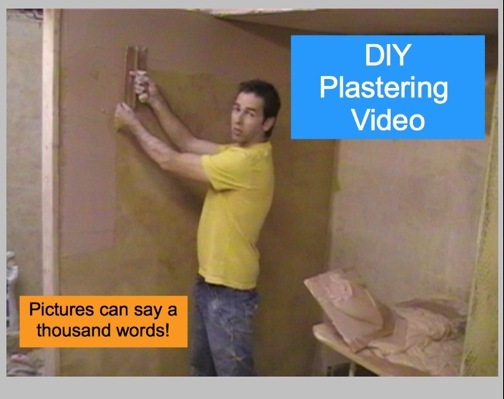 For less than the price of 2 bags of plaster you can join the Online Plastering School and access all the videos and guides. This is what I was looking for!!
" Could not recommend this course more, excellent value, learnt everything i needed to know and the tea was brewed to perfection." I recently purchased your DVD and found it to be the most useful training DVD I have ever received. I am a 70 year old refurbishing an old house. I just completed the plastering of a bathroom under the sole guidance of your DVD. The result is stunning (by my standards) to say the least. When I look at the walls I can't believe I did them on my own. You are a good teacher and I really appreciated your attention to details from the angle of the trowel to cleaning the bucket immediately. Hi, I just want to say that after watching your DVD I had a go at skimming over my kitchen chimney breast (1930's semi). I started with the 'easier' sides and must say that the results were fantastic. The larger front piece was an exercise in trust, but by following your guidance, I have produced a very, very good finish. My neighbour, who's been in the building trade a long time was shocked by the results! He did say that is wasn't "Quite a glass finish", but I told him that decorators prefer an egg-shell finish - That told him! I bought your DVD and guide in March. I also asked you about plastering ceilings. Your advice and materials were excellent. I have now completed several ceilings, walls etc with perfect results. I have even done some cement plastering in the bathroom (your tip on plasticizer was great). In the US the plastcizer usually comes in the form of various admixes (usually acrylic) and they are mostly sold as for mortar beds for tile installations and Stucco (our term for render). If you have any follow up videos or materials please let me know.